Discovering the ‘soul’ of Russia in tiny Rostov Veliky, a provincial town barely a few hours from Moscow, and following the ‘artist’s way,’ the author also found a way to the heart; through the gastronomic delights of Tatar fish soup at the township’s ‘Ukha’ festival! Finding myself stuck in the midst of a creative crisis I decided to follow advice I had read about in “The Artist's Way” by Julia Cameron. When your inner artist is exhausted, said Cameron, you need to go to a calm and serene place, switch off from the daily grind and your mobile phone, and listen to your inner self. So I jumped into my car and drove off to Rostov Veliky, barely three hours away from Moscow, to recharge my drained creative batteries. My trip coincided with the fun and delicious Rostov Veliky Ukha Soup Festival. The town’s main square was filled with groups of people from different regions of Russia. They were all cooking “ukha,” Russia’s most popular fish soup, using local, regional recipes. While soup was being served up, several authors of children’s books came to the town square to meet their little readers. At another end, a few charity organizations collected money for their various causes. The ‘Ukha’ jury went from one pot to another, scooped up the soup with large spoons and tasted all the regional variations of the soup. They were evaluating the quality based on three criteria: the broth, the fish and the dish as a whole. The festival was a lot of fun, but since the aim of my little journey was to spend some time with myself, I ate a bowl of delicious Tatar fish soup and escaped from the crowd. I went for a walk around Rostov Veliky. The impressions I got from this small Russian town are comparable to those I had after visiting Venice in Italy or Toamasina in Madagascar. I saw authentic Russian exoticism up close for the first time in Rostov Veliky, despite having been born in Russia and lived my whole life here. People often and rightly say that Moscow is not the “real” Russia. Rostov Veliky is undoubtedly a must-see place for Muscovites, Peterburgers and residents of large cities from around the world. It paints a different picture of life than one sees in Russia’s largest cities and gives you the opportunity to put your own life into perspective. One of Russia’s most ancient cities is quite rough around the edges and desolate with the exception of its beautiful Kremlin, which is the town's main enterprise. In a wonderful way all of this goes hand in hand with the pride and dignity of Rostov Veliky. It was my first visit to this town, yet I strolled along the streets with a strange sense of familiarity, as if the paint chipping on every corner and every pothole in the street were somehow known to me. I just hadn't seen them in a long while. My exhausted inner artist was enjoying the walk and interacting with a type of melancholy that you can only find in Russia, when suddenly I was interrupted by a phone call. It was my father. He asked if I had arrived safely and told me that my great grandfather had worked as a horse cab driver in Rostov before the Russian Revolution of 1917. Every morning he attached a cart to his horse and drove passengers all day long, similar to Russian émigré writer Gaito Gazdanov in Paris many years later. I hung up, switched off my phone and got to thinking: was it a coincidence or does genetic memory really exist? Legend says that in the old days the holiness of Rostov Veliky was so undisputable that its residents didn't even consider building fortress banks or other protective constructions around it. Even the suspicious Ivan the Terrible came here to hide when he felt unsafe. However in the Time of Troubles (1598 – 1613) the city was attacked and all of the inhabitants were slaughtered. There wasn't a single person left alive to bury the bodies. Only two steps away from the Kremlin (well, everything in town is a frog's leap from the fortress) is a hotel for visiting artists who arrive to paint life in a typical Russian town. These visitors can enjoy freshly baked bread from the monastery and stroll along the embankment. If only there were wooden platforms on the banks of Lake Nero, this place would be perfect for yoga: the sun rises directly over the picturesque lake. The Kremlin itself has a hotel on its premises, so it is possible to spend a night in the sacred old chambers. On the next day foreign guests can book a guided tour in English or take a master class in how to ring church bells. 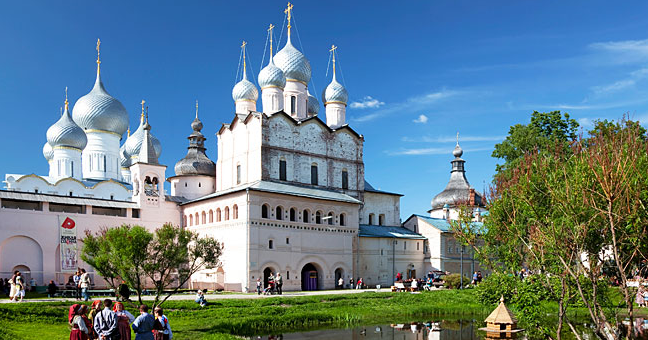 After the Kremlin tour and some rest by the nearby lake take a walk around this small town. You will find the old Dutch fortress bank, which was built after the Time of Troubles (1598-1613), and today overgrown with nettle, burdock and dandelions; a section of town featuring buildings constructed during the rule of Catherine the Great; and old wooden houses with carved window frames. The streets are surrealistically empty – there is hardly anybody outside, as many have left looking for a better life. It is a perfect location for filming, a fact not lost on Soviet and Russian filmmakers who have shot many projects here over the years. This town has always attracted artistic people. Any doubts I had about Rostov Veliky 's unique mission disappeared when I reached the bank of the gigantic, mysterious and incredibly blue Lake Nero, which came into existence before the Ice Age. One can spend hours sitting on its banks, looking at the sky’s dome reflecting in the lake or through binoculars at churches on the other side. They say that a person with good eyesight could count as many as 30 churches before the Revolution in 1917. Many of them remain today. On the banks of Lake Nero, like it or not you may enter a meditative state. The artist in you wants to play again and is ready to give you fresh unconventional ideas. Rostov Veliky is a tiny Russian town with a very strong energy and it can rescue even the most fatigued person in the world from any artistic crisis they might be experiencing.